*Click here to see important information about comparison rates, terms and conditions. Subject to funding. Fees, charges, terms and conditions apply. Excellent service and quick and I recommend them to anyone. Thank you so much to the staff at Harmoney. *Based on a 5 year term. Subject to approval and funding. Harmoney’s interest rates range from 6.99% p.a. to 28.69% p.a. and are offered based on the individual borrower’s credit assessment according to Harmoney’s credit scorecard. In order to be approved and list your loan you must meet Harmoney’s credit criteria and responsible lending requirements. Fees, charges, terms and conditions apply. WARNING: This comparison rate applies only to the example or examples given and may not include all fees and charges. Different amounts and terms will result in different comparison rates. Costs, fees, government charges like stamp duty and cost savings are not included in the comparison rate but may influence the cost of the loan. Harmoney is Australasia’s leading marketplace lending website. If you need a personal loan, we’ll help you connect with Investors who want to fund your loan, without the need for a traditional intermediary. That way, everyone gets a better deal. When a Borrower applies for a personal loan and gets approved by Harmoney, they can make a listing in the Marketplace. Investors check out the listing and decide whether they want to fund the personal loan, and how much they want to invest. After the loan is fully funded, the Borrower repays the Investors over the next 3-5 years via Harmoney. Our online marketplace makes applying for a personal loan easy. Do it at the time that suits you, without worrying about face-to-face meetings. We’ll make sure your interest rate suits your circumstances. Our rates range from 6.99% p.a. to 28.69% p.a. (7.69% p.a. to 29.55% p.a. comparison rate)*. Borrow $5K – $70,000 unsecured on 36 or 60 month terms. All our personal loans are unsecured, so you won’t have to put your house or car on the line to get the help you need. Want to know how much you’ll be repaying on your loan? Whether you want $5,000 for a family holiday or $70,000 for home renovations, our personal loan calculator will give you an idea of what your repayments will look like over a 36 or 60 month period. We’ve made applying for a personal loan easy with our 100% online application. There’s no obligation to commit if you change your mind, and approvals can be valid for up to 60 days. Our personal loan rates range from just 6.99% p.a. to 28.69% p.a. (7.69% p.a. to 29.55% p.a. comparison rate)*, and if you picked up an end of year bonus and want to pay off your loan early, we won’t penalise you for paying off your loan early. Looking for a smarter way to borrow? Marketplace lending is the revolutionary new way to take out or fund a personal loan. We’ve introduced this global phenomenon to Australia, helping Aussie Borrowers and Lenders enjoy a better experience using our automated, 100% online process. Find out more about marketplace lending. An unsecured personal loan doesn’t require any assets as collateral. All loans on Harmoney’s marketplace are unsecured – so there’s no risk of your house or car being repossessed if you’re not able to make a payment. Harmoney connects people who want to borrow money with people who want to fund loans. Our online marketplace is a simpler way to get a personal loan. Personal Loans with Harmoney from Harmoney on YouTube. If you’re curious about credit ratings, and how savvy Australians are improving their financial well-being with some simple tricks, we’ve written a free eBook. 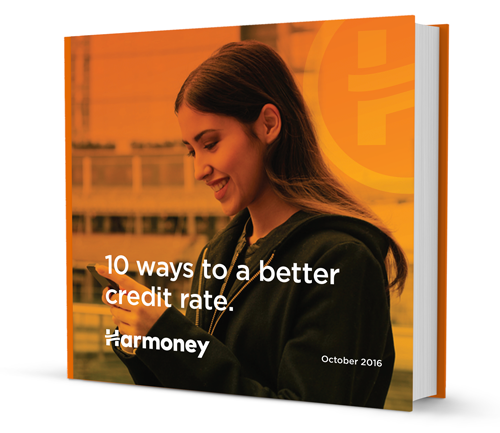 Download "10 ways to a better credit rate" and learn how you could improve your credit record by managing your loan well. How does marketplace lending work? Marketplace lending is a revolutionary way for Australians to borrow between $5,000 and $70,000 for almost anything, from consolidating your debts to improving your home. Investors can fund as much of the loan as they want to, with great rates for both Borrowers and Investors. Find out more about marketplace lending. All loans through Harmoney’s marketplace are unsecured, so Borrowers don’t need to put down an asset such as their car or house as collateral. Are there any restrictions on what I can use the money for? So long as your intentions are legal, you can take out a personal loan for the purpose stated in your loan application. Some of the most common reasons why Borrowers apply for a loan through Harmoney include consolidating debt, renovating a home, upgrading a car and going on a dream holiday. So long as your intentions are legal, you can spend the money on whatever purpose you stated in your loan application. Some of the most common reasons why Borrowers apply for a loan through Harmoney include consolidating debt, renovating their homes, upgrading their car, or going on a dream holiday. To be eligible to apply for a loan through Harmoney’s marketplace, you must be an Australian Citizen or permanent resident, or a New Zealand citizen with an Australian driver licence, Australian passport or New Zealand passport, a current Australian physical address and an Australian bank account. You must also be at least 18 years old when you register and have an acceptable credit record (to be determined by Harmoney at its discretion). You can even apply if you’re outside the country, if you’re a permanent resident. All loans must be taken out by an individual, rather than a company or other legal entity. Harmoney became New Zealand’s first licensed marketplace lending website in 2014, and since then, we’ve become the largest and fastest growing marketplace lender in Australasia. Like all good Kiwi inventions, it wasn’t long until Aussies wanted to claim ownership too. So we’ve crossed the ditch, revolutionising the finance industry and providing an easy way for Borrowers and Investors to connect online. Read more about our team and our company story.